“I wonder if you know it, but I have realized something,” says one of the characters in Ratnayake’s 2012 Gratiaen Award winning novel, “stories can kill.” �If, as some historians would claim, the past cannot be explained as one grand overarching event or as an absolute truth, but can be explained only as several different narratives, many layered stories of different people and communities, where one absolute truth cannot exist because each person’s story of it will be different, then its retelling is going to be a challenge. In this method of retelling history, every person would have her personal story to tell. And every other person would have the right to disagree with it, and the right to claim that her story is the one that is right. Of course, as the listener should know, it will be “right” only in her eyes. Unfortunately, if there is one place an overarching generalisation about the retelling of history is possible, it would be in the fact that not everyone gets the opportunity to voice her story. �Stories are rarely told of people who are in positions in life that haven’t empowered them, and rarely told by them: the man who ends up in a sealed room in an asylum, the old caretaker who waters the flowers in the temple premises, the housewife who didn’t bring in a dowry. People without power are the silent people who move in and out of our lives, and those we look through, until something moves them into speech. This speech, however, is never the quiet, self-assured speech of the confident company director or the articulate and rational speech of the overseas-educated university lecturer. To the silent and unheard people, words of pleading, words calling for help, and words themselves, no longer suffice. Theirs become a speech voiced through actions of chaotic desperation, which can be harnessed into brutal rebellion. As Ratnayake says through one of her characters, “[w]hen no one listens, violence is the only thing loud enough to be heard.” Sri Lanka’s post-independence history is overshadowed by one type of historical story: the story of unheard and silent people resorting to violence to be heard and trying to be loud enough to draw a response from those in positions of power who refuse to see the desperation of their existence. In There is Something I have to Tell you Ratnayake tells many stories. These are of the six main characters, of varying social backgrounds, who weave in and out of each other’s lives.�Janu is the boy born into the upper crust of Sri Lankan society. His father is an Oxford educated socialist and his mother of a family that revived the handloom industry in Ceylon. On a pettagama in his mother’s home sits a large photograph taken at the opening of the weaving centre in their garden, of “Pandith Nehru in his smart white kurta, SWRD Bandaranaike in his white sarong”. Upali is the boy whose mother found shelter in Janu’s ancestral home. Upali’s mother works as the maid in the house, hiding a devastating secret about his father from him. Anila lives on Melder Place, occasionally stepping into a westernised social circle through her music and the Burgher families that live down her road, until she gives up her violin lessons when her uncle reveals to her what the Violin and Virginia Woolf stand for. He reads to her Woolf’s diary entry on E. W. Perera: the poor little mahogany coloured wretch, of the same likeness of a cadged monkey, sauve on the surface and, inscrutable beyond. Perera had visited the Woolf household to ask Leonard to plead for the release of Edmund Hewavitarne and other incarcerated Ceylonese. But he had made Virginia uncomfortable by producing an envelope of lace – “a souvenir from Ceylon, Mrs Woolf”, he had said, but to Virginia, it was more correctly a bribe and she had no choice but to take it. Then, there is Kamal and Sarala, the children of a Sinhala language teacher in a village school, and Chaya, who wears “cheap dresses to university”, but whose mother could “have been shot [by the JVP] for the cost of the sarees she wore”. The novel is a sweeping account of the characters’ lives that are set firmly within the backdrop of the most significant moments in Sri Lankan history. As Anila grows from a ten year-old into a young woman, we watch how the events of July ’83 unfold in her life. In ’89 we watch the events of the JVP unrest unfold as an expression of their anger and bitterness for some of the characters, and as a moment of possible death for others. The author’s voice can be heard clearly through her characters when they give the historical backdrop to the events, and the reader can never ignore that the beginning and end of each character’s story is a moment from the history of this country. Ratnayake sets her characters along a vertical line of Sri Lankan society and narrates their stories, giving us different views of the same historical event. The complex web that binds the six characters together is a wonderful reflection of modern Sri Lanka. 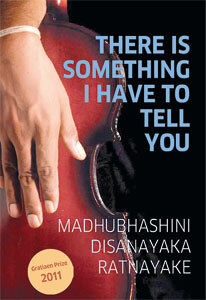 There is Something I have to Tell You is a novel of different lives told by Ratnayake with great sensitivity and a keen understanding of their origins, using her well-honed skill of evoking a sense of moment and setting through language. Yet, unlike in the history of Sri Lanka, the voice that finally and unexpectedly emerges and attempts to own the entire novel, is that of a character who would not have had that opportunity to tell his or her story. Unlike in history, in fiction, as Ratnayake magnificently displays through her craft and her novel, it is possible for marginalised people to tell their story themselves. However, even within the pages of a book, it could destroy them in the process of doing so. The book will be launched today.